The SomnoGuard's dual FDA indication for both Snoring & OSA make it an ideal solution for your patients and practice this time of the year. Being among the most convenient, efficacious and cost-effective solutions for either affliction enables patients to address their particular circumstance without breaking the bank. Presenting the SomnoGuard as apotentially covered service, while providing a low out-of-pocket solution, whether deemed applicable to deductibles or not, is a model that has proven effective for many practices. As the SomnoGuard is indicated and proven efficacious for primary Snoring, universally considered an out-of-pocket service, it presents a unique opportunity to provide an immediate solution to satisfy the patient's initiative to address their snoring while ALSO initiating treatment for potential OSA. 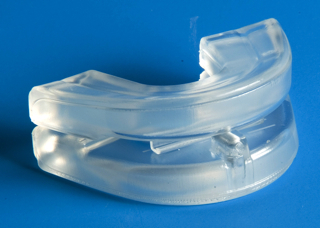 As not all patients are willing to undergo the diagnostic process to assess OSA, by presenting the SomnoGuard to patients as they present for snoring sets them on the path to improving their quality of life and potential sleep disorder breathing. The SomnoGuard also satisfies the clinical criteria to make it eligible for coverage under many commercial insurance plans under HCPCS Code E0485 or CPT 21085 (depending upon insurer specific Medical Policy, prefabricated, custom fitted Oral Appliance). This coverage is subject to individual plan parameters, including potential preauthorization and referral as well as insurer specific criteria to establish Medical Necessity. We have available to your administrator an Insurance Matrix (SomnoGuard Administrative Assistant - available for download in the sidebar) that enables you to document your primary insurer's criteria upon initial inquiry and streamline this process for subsequent services. Regardless of your administrator's diligence to ensure all criteria are satisfied (documented OSA, AHI thresholds, failed CPAP (sometimes required)) coverage is ultimately determined upon claim submission, and if denied for any reason makes collecting from the patient undesirable. A document similar to an Advance Beneficiary Notice is also available to present to your patients to enable direct initiation of the SomnoGuard therapy through a "deposit" program that documents a policy of Claim Submission for the service while placing the onus of insurer reimbursement on the patient until such time as any reimbursement is reconciled. 1st Line Medical is a leading provider of Home Sleep Testing services via prescription that can be arranged through a Screening Service which provides highly discounted access to test any patients presenting with Snoring for possible OSA. Our WatchPAT Home Sleep Testing program utilizes the most patient friendly, yet clinically advanced technology, to assess respiratory events through systemic sympathetic responses of the body's cardiovascular system. This wrist-watch platform eliminates annoying and obtrusive nasal cannula and breathing effort sensors while also possessing the capability to assess sleep staging and sleep time to provide a very accurate depiction of the patient's sleep architecture. 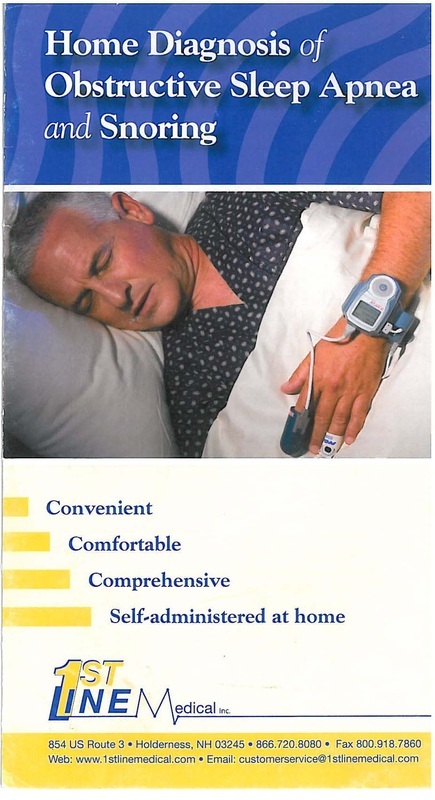 For a modest $165 (shipping surcharges apply in some regions), the patient can participate in an easy and efficient Sleep Study at home enabling you to determine if the SomnoGuard therapy initiated is to address snoring alone or is now potentially eligible for insurance coverage under OSA medical policy criteria. An example Patient Brochure and Prescription Order Form is provided in the sidebar to support this potential complement to your current sleep patient workup process if you do not already possess a diagnostic capability. Simplifying and expediting the initiation of treatment for both Snoring & OSA will yield better health, outcomes and QOL for your patients and improve your practice performance. Maintaining the patient relationship through evaluation, diagnosis, therapy initiation and compliance with medical therapies will identify those that are not compliant and may therefore be potential candidates for surgical intervention. Please contact your SleepSource Alliance Clinical Specialist to obtain support for any aspect of your Sleep practice.